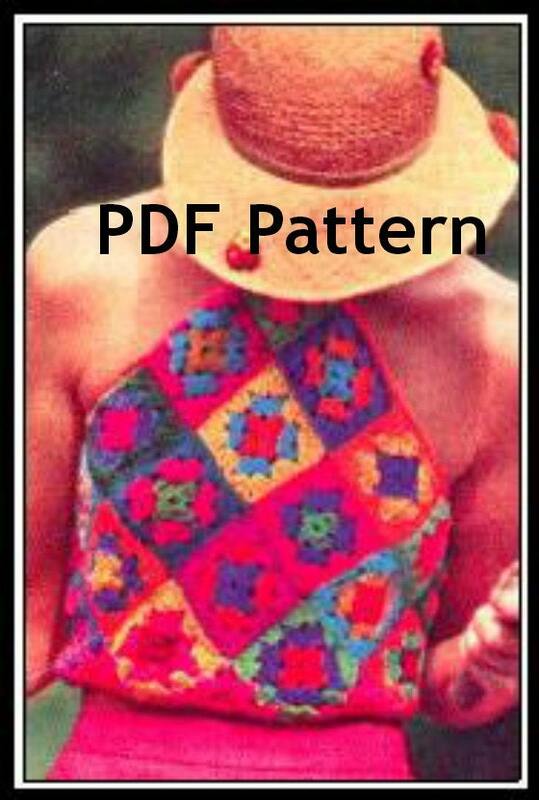 This classic vintage 1972 crochet pattern is for a Granny Square Patterned Halter Top, in PDF format. Scarf-shaped halter has 21 colorful granny square motifs sewn together to form a triangle. Top ties at the back of the neck. Size: One size fits all. Materials: Sport yarn; small amounts of any desired colors, about 4 oz. This charming PDF file is from my vintage archive. This item is in PDF format for instant download. You will need adobe or any other program that can open PDF files. If you do not already have it, it can be downloaded for free at: http://get.adobe.com/reader/otherversions/ This listing is for the PDF ONLY and does NOT include the item itself. You will receive instructions from Etsy regarding download after payment is confirmed. 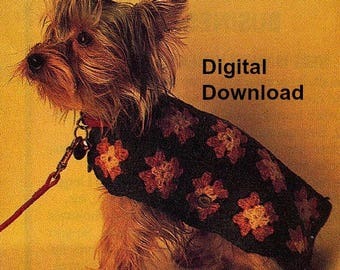 If you blog about this item, I will give you a 25% discount on any pattern in my store. **Note: you must provide the link to your blog showing my item. You can convo me this info and I will send you the Coupon Code. When selling items made from this PDF pattern online, or if you blog about them, I would appreciate it if you link back to BubbleGumInTheMail’s Etsy shop. I’d love to see photos of your finished work! Have questions? Convo me, All sales are final. Great pattern - really looking forward to getting started on it! Love the design--great pattern/good instructions. I'm going to get creative with this one!! Nice directions, unusual shape and look forward to making one. Directions certainly worth the money.